See Terms and Conditions for full details of delivery and conditions of hire. 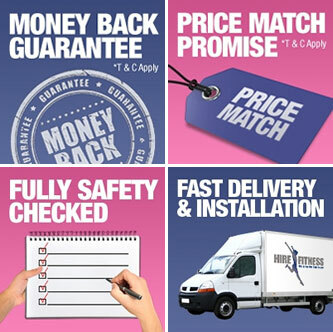 Deliveries are made throughout the UK and Ireland, by our local network of Hire Fitness franchises. Delivery prices are stated on each product and hire period on the website. This charge covers both the delivery and the collection of the fitness equipment. Delivery or collection will normally take place during Monday to Friday between 9.30am and 4.30pm unless otherwise agreed with the hirer. Delivery and collection times are usually arranged to suit the hirer where possible. Please note, we cannot be held liable for any damage made whilst delivering, collecting and installing fitness equipment in the hirer's requested location. If the hirer cancels the delivery or collection with less than 24 hours notice or the hirer is not present at the agreed time, when delivery or collection is made, we reserve the right to make a charge of up to £50.00 for re-delivery or collection of the equipment. We may charge extra for deliveries and collections outside the standard hours of Monday – Friday, between the hours of 9.30am and 4.30pm.